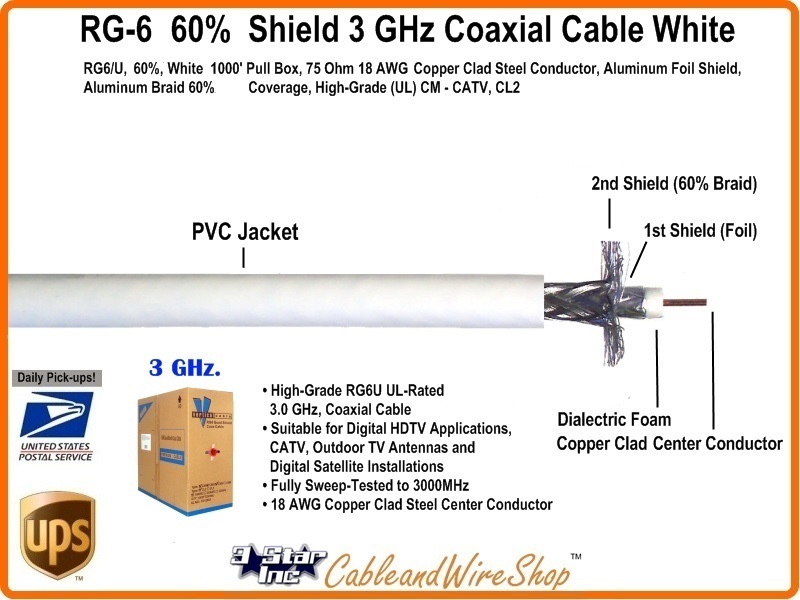 RG6/U, 60% Braid, White 1000' Pull Box, 75 Ohm 18 AWG Copper Clad Steel Center Conductor, Aluminum Foil Shield, Aluminum Braid 60% Coverage, High-Grade (UL) CM - CATV, CL2. High-Grade RG6 UL-Rated Coaxial Cable Suitable for Digital HDTV Applications, CATV, Outdoor TV Antennas and Digital Satellite Installations. RG6 (RG-6) with 60% Braided Shield coverage is the most commonly used form of this Utility Cable. The Variants within this sub-category usually are denoted by differences in Center Conductor and Shield Material Composition. Starting first with the Shield, Aluminum Braid will be used in concert with a Aluminum Foil Layer bonded to the Dialectric surrounding the Center Conductor. This the most common variant within the variety and is appropriate for most uses. 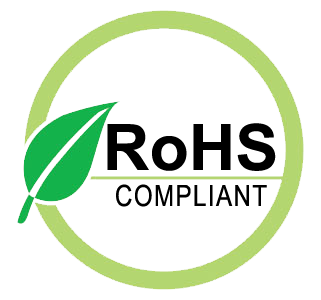 The limiting factor in its use will be the density and strength of interfering carriers found ambient in the environment of use. 60% Braid coverage is not recomended for lengthy networks or distribution systems in Hotels, Motels and Apartment Complexes as these environments are open to reception of frequencies being re-used over the air, coupled with the antenna radiation-like properties of large distribution networks with poor Grounding. Copper Shielding with the same 60% Braid Coverage does perform better in these environments due in part to its lower DC Loop Resistance. Whereas Aluminum Braided Shield usually goes hand in hand with Copper Clad Steel Center Conductors, likewize goes Copper Braided Shield with Solic Copper Center Conductors. Copper Clad Steel will suffice in almost any utilization scenario, however most Satellite TV Operating companies will require Solid Copper Center Conductor to be used by their respective Sub-Contractor Installers for Maintainence and Warranty issues. This is due to the DC Voltage component being fed from the Receiver back to, and Powering the LNB(f)s mounted on the Satellite Dish. Unless the run is extremely long and the connectors applied are of dubious Quality, the DC Loop Resistance difference between Solid Bare Copper and Copper Clad Steel is negligible in short distances.